Many thanks to all of you wonderful booksellers who are stocking our books! It has been great to get to know some of you over the past year, some ‘virtually’, some ‘in the flesh’, as it were. It is great to be working with you and to hear some of your stories. It never ceases to surprise me how creative and ingenious some of you are, with cafés opening, events happening, online stores and social networking all making a difference. Good on you: you are doing a fantastic job. It has also been sad to see more shops closing … every loss is a loss to us all, in a way. 1. This isn’t strictly Dernier Publishing news, it’s more personal, but for those of you who don’t know, I will be marrying Andrew Wilson on 2nd July. After eight years on my own since my first husband died, it is wonderful to have someone to share life with. We met at CRE last year. (I’ve since met another couple who met at CRE!) Andrew is on the staff of a charity that supports those around the world who are persecuted for their faith in Christ. He is also a former journalist, and does some editing and proof-reading for us. 2. We now have nine books out! When I wrote the last piece for Phil’s blog, back in August, we only had six – that’s a 50% increase! Beech Bank Girls II: Making A Difference (chick lit for 10-14s), The Only Way (brilliant book for teens), and The Birthday Shoes (surprise adventure for 8-11s) are all great books. It’s so exciting to see our list grow – not so we can have a bigger stock, but so that we can reach more young people with the good news of Jesus, through exciting, relevant stories. Now that is something to be excited about! 3. Beech Bank Girls I: Every Girl Has A Story was shortlisted for the Christian Resources Together Awards (children over 12 category). Whoo hoo! How amazing is that?! 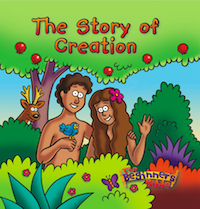 Although we didn’t win, this still means that this book is one of the three most popular Christian books for children of this age in the whole of the UK – wow! Several kind booksellers told me that they thought we should have won – if that was you, thank you very much! Thanks also to everyone who nominated and voted for us, and congratulations particularly to Eleanor Watkins, the author. It’s a brilliant book, worth every penny of the £5.99 price tag! Book III in the series is due for release in October – maybe it will win the award next year?! 4. I did my first ever radio interview on Premier Radio – Lizzie put me at my ease and I was soon into the swing of it. Several enquiries and encouragements have come from that interview, so thank you, Premier Radio! 5. I was asked to present a prize at the Church School Awards (and met Andy from Blue Peter!) 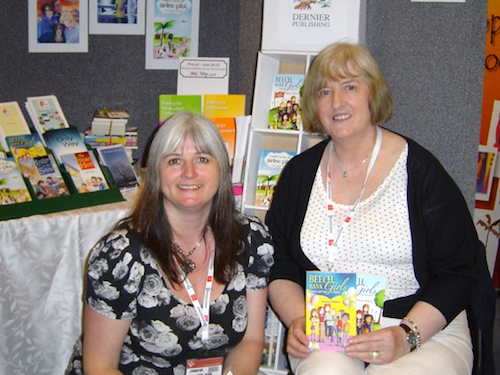 This was a great opportunity to begin inroads into books for schools – again, this wasn’t something I set out to do, but the door just opened for us to be there. 6. I Want to Be An Airline Pilot and Beech Bank Girls II: Making a Difference are in the Speaking Volumes catalogue; and The Birthday Shoes was Kingsway’s book of the month in April. So encouraging! 8. If all of this seems a bit over the top to those of you who are used to dealing with established publishers, please be aware that we started with nothing, not so long ago – precious little knowledge and one computer in my dining room! It has been continually amazing to see the hand of the Lord at work. Any success we have had is by his grace alone [Editor’s note: don’t dismiss your own hard work too quickly, Janet! It’s grace and guts in this game of following Jesus!]. He has brought along opportunities, made a way where there seemed to be no way, performed many miracles. I do believe that his heart is so much for our young people, who are growing up in an increasingly dark environment, where sin is no longer considered sin, where to go to church and believe in Jesus is weird. My niece, aged 15, not overly academic, read one right through last night and loved it. I think it’s the first time in her life that she’s read a whole book from choice! Must be good! What a joy to have a good news story and a reflection on what can be achieved by hard work, inspiration and prayer.